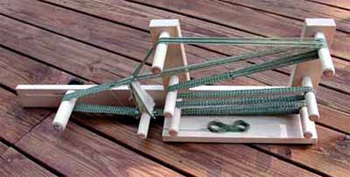 Pictured above is a tape loom Jim built using a pattern in one of Elizabeth's books, "Tape Looms Past and Present" by Bonnie R. Weidert. 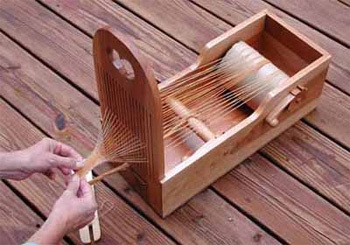 The loom is made from cherry wood that was salvaged from sawmill slabs. The wood was planed to 1/2 inch thick on Jim's newly purchased DeWalt thickness planer. The round beams were turned on a wood lathe and the ratchets were cut on a band saw. Weaving nice edges on such a primitive loom is more of a challenge than it appears at first. This is another tape loom which Jim and Elizabeth built. The frame is made from 1/2-inch cherry and the pins are made from dowel. In this picture, Elizabeth holds the loom between her knees. 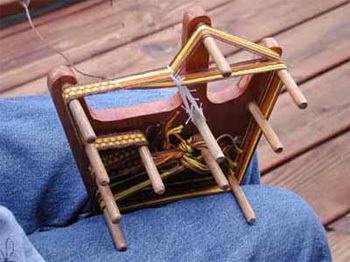 The loom is very lightweight, portable, and can be used by a passenger while riding in an automobile. The pattern is from "Small Looms in Action" by Elizabeth Jensen. This is really Jim's loom, but he has not acquired warping skills as of yet. This will someday become a hatband on a favorite winter hat from Pendleton. A previous project of Stars and Stripes bookmarks wowed the smaller guests on a festival day at the Farm Museum. We have another tape loom but this is our favorite because of the ease in adjusting the tension and advancing the work.